These days we’re all too familiar with the beast of sleep deprivation. We can all agree that adequate rest is important, but it’s one thing that consistently gets skimped on. There are just not enough hours in the day (or night)! According to Gallup poll information, over 40 percent of Americans don’t get the seven to nine hours per night recommended by the National Sleep Foundation, with the average being only 6.8 hours. As you can probably guess, parents are especially deficient. A survey by Silentnight reported that in the first two years of a child’s life, parents lose a whopping six months worth of sleep. When they do sleep, most don't stay asleep for more than three hours at a time. Research published by the American Academy of Neurology found that for each child in the house, mothers were 50 percent less likely to get a full night’s sleep. (So if you’re a mom with three kids, you’re 150 percent less likely to sleep like you should. Oof!) Additionally, moms felt more tired overall than women without children. (No surprise there!) Meanwhile, dads’ sleep quantity and quality remained largely unaffected. Lucky! Of course some sleep loss is inevitable during the early stages, but once kids are older we can finally start sleeping through the night, right? Uh, not exactly. There’s work to do, bills to pay, plans to make, lunches to prep, homework to help with, and endless other things to worry about. Plus it’s just hard to get out of that habit of waking through the night, believe it or not. It impacts your kids, too. You may think your incessant insomniatic state only affects you, but a recent study published in Sleep Medicine reveals that a mother’s sleep habits have a big influence on her children’s likelihood to develop sleep problems as well. Researchers studied 191 kids aged 7 to 12 and their parents. Moms and dads filled out a questionnaire on their own and their children’s sleep habits. Kids were tested overnight via in-home EEG (electroencephalography) to monitor how long it took to fall asleep and record sleep stages and quality throughout the night. The results showed that maternal insomnia symptoms were associated with worse sleep for their children. Moms who struggled with sleep tended to have kids who had a harder time getting to sleep, inadequate sleep duration, more night waking, and more daytime sleepiness. "These findings are important because sleep in childhood is essential for wellbeing and development," commented Dr. Sakari Lemola, lead researcher. "The findings show that children's sleep has to be considered in the family context. In particular, the mother's sleep appears to be important for how well school-aged children sleep." As you would expect, sleep deprivation in kids has all the same effects as it does in adults but with the added complications of making learning and school activities more difficult. What’s really causing the problem here? Is it simply genetic or are there environmental factors? This study was only observational, but most likely there are multiple things in play here. If you struggle with sleep and suspect your child does too, it’s time to think about how you can change this for the better. Is the bedtime routine a big stressful struggle? Do you/your kids go to bed with lights or screens on? Are there late night arguments going on between you and your spouse? Are you anxious and hurried at night, trying to get everything done, and maybe this is rubbing off on your kids? Regardless of age, now is the time to start establishing healthy habits. We set the example for our kids, 24 hours a day and night. Maybe the answer is not focusing on their habits, but our own. 1. Switch off the screens. Electronic devices like TVs, iPads, and smartphones emit blue light, which totally messes with your body’s natural circadian rhythm and production of sleep hormones, making it difficult to fall asleep. Set a cut-off time from all the devices, at least an hour before bedtime. It’s worth it! 2. Stick to a consistent bedtime. Try to go to bed at the same time every night. This helps set your natural wake-sleep rhythm and your body and brain will know exactly what to expect every night. It’s just as important to have a set bedtime for yourself as it is for your kids. 3. Get moving. Regular exercise is proven to improve sleep time and quality as well as boost overall energy and health. So get out and move every day! It doesn’t have to be complicated, expensive, or time consuming. Simply walk, jog, or do indoor workouts (YouTube is a goldmine for free workout videos of your choice). Just get the blood flowing and you’ll soon feel the positive effect on your sleep. Just avoid exercising close to bedtime, however, as the energy boost might actually make it hard to get to sleep. 4. Consider your coffee. If you’re like most parents, you need a lotta java to power your day. And that’s fine, since coffee itself is actually good for you (if you go easy on the cream and sugar). But you need to make sure you have your last cup at least six hours before bedtime so it’s not still acting on your system and making it difficult to shut down. Same goes for other caffeinated beverages like tea. 5. Avoid meals close to bedtime. If you’re a late-night eater, you may want to cut it out. Having to digest food when your body is supposed to be resting isn’t helpful, plus this can lead to acid reflux and indigestion issues at night. 6. Make sure your bed is comfortable. If you toss and turn all night because you're uncomfortable or even in pain, it may be time for a new mattress, or at least a therapeutic mattress topper. Make sure you have supportive, cozy pillows, too. The difference makes the investment well worth it! As parents we can all attest that getting enough shut-eye is not easy, but if you improve your sleep life, it will change your total life for the better, not to mention your entire family’s. So try to prioritize it as best you can! 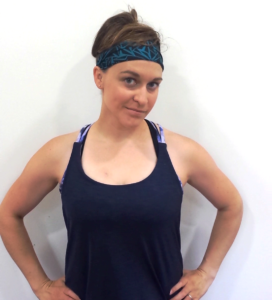 LJ Kunkel is a mom of 3 who writes about health, fitness and parenting. She keeps her head on straight by working out, getting stuck in yoga poses and hiding all the chocolate.